This entry was posted on July 15, 2012 at 4:08 pm and is filed under Drama, History with tags 2008. You can follow any responses to this entry through the RSS 2.0 feed. You can leave a response, or trackback from your own site. Man, that sounds really, really good. I need to see this. I totally agree man. On a human level how can such atrocities happen? I’m actually Scottish and share a great affinity with my Irish Celtic neighbours. We are very similar types of people but if truth be told, some Scots were also involved in this. It makes me ashamed to even be associated with this kind of barbarism. The film itself is an absolute masterpiece. I can’t praise it enough. This and most recently, SHAME have become two new favourites of mine. I can’t wait for the next McQueen and Fassbender collaboration. I love this film so much. If you can say you LOVE something this hard to watch. The long take scene with the monologue, the running the gauntlet scene, the sweeping the urine… all amazingly shot from a director that is well on his way to being a modern day Auteur even after only 2 features!! I hear you man. It’s an astonishing film. I had actually seen when it was released and really liked it but think I blocked a lot of it out. A rewatch was always on the cards and it ranks as one of my favourites now. These three scenes you mention are sublime and I totally agree with your opinion on McQueen. He’s got a 100% record in my eyes so far. I’ve been meaning to check this out. I don’t think I’ll be seeing SHAME but this one does sound very intriguing. Great review, Mark! Thanks Ruth. It’s definitely worthy of attention. It’s became a new favourite of mine along with Shame. Both are very hard-hitting film’s but absolutely superb. Fassbender is the actor to contend with these days. Nobody is taking their performances to his limits. As for McQueen, he’s proven in only two film’s, to be a force to be reckoned with. Very hard-hitting Vinnie but worth every minute of it. If you’ve seen Shame, you’ll get the idea of it’s style. If not, put them both at the top of your wishlist. That unbroken 10+ minute take blows my mind every time. Indeed! It a marvellous moment. Like I mention in my write-up, it’s a moment that could stop the movie dead in it’s tracks but actually comes across as captivating. I just love this film. I can’t fault it. Excellent review, Mark. 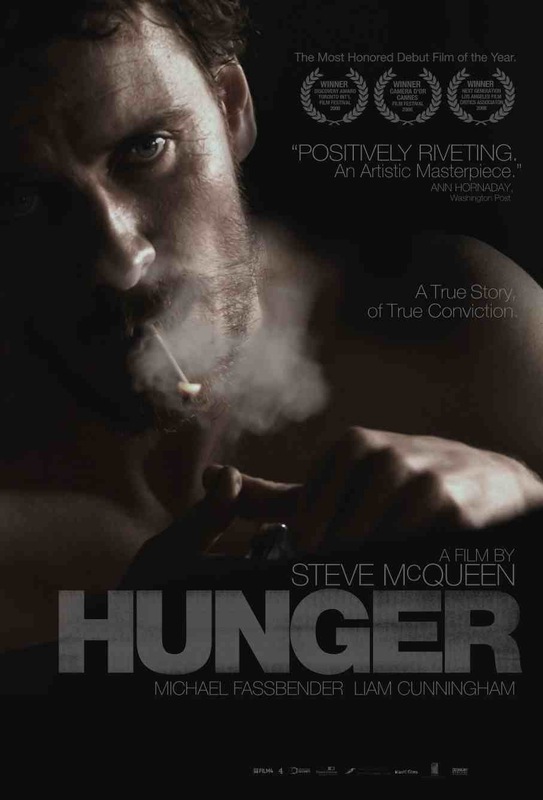 Shame was a great film so I’ll try to check out Fassbender and McQueen’s previous collaboration. We both know they can deliver. Thanks Fernando. If you liked Shame, you’ll like this. It’s as good, if not, slightly better. Well worth checking out. You should love this film too then Mithil. It really is powerful and hard-hitting stuff. It’s also highly artistic though. Let me know how you get on when you see it. Great review. ‘Hunger’ is an amazing film. I sympathize with the Irish 100%, and appalled about the actions of the British government at the time. Incidentally, I started writing review on this film too about a week ago, but apart from mentioning a background story and throwing words like ‘inspirational’ and ‘brave’ in it I did not get far. It seems that mere words cannot communicate all the artistic merit this film deserves. I totally agree. When I wrote down my thoughts, I actually went on one and delved more into the struggle. It started to sound more like a rant and very opinionated, so I had to erase a lot of stuff and focus more on the film itself. I couldn’t resist mentioning a bit about my personal feelings on the subject but it would have been a lot worse if I’d stuck to my original draft. There’s certainly no denying the film’s artistic merit though. Regardless of what side of the fence you sit on. It’s a powerful and affecting piece of work. No doubt about it. Superb review Mark of one of the greatest films I have ever seen. I am going to watch it again very soon. Every scene in the movie is perfect. I will never forget how terrifying I found the riot scene the first time I saw it. Those senseless, mindless beatings. One of the scariest things I’ve ever seen in a film. Thanks Tyler. I couldn’t agree more man. Such a powerful and unrelenting film. I had seen it years ago but didn’t fully appreciate it until I watched it again recently. I found myself getting very angry throughout the senseless brutality these men faced. McQueen and Fassbender are certainly a duo to be reckoned with.